Tim Cook has just walked on stage and kicked off the Gather Round keynote. If you’re tuning in just now, we’ll bring you some live updates from the event. Apple kicks things off with the usual video of Apple Park. Oh, this is one hell of an intro before the event. 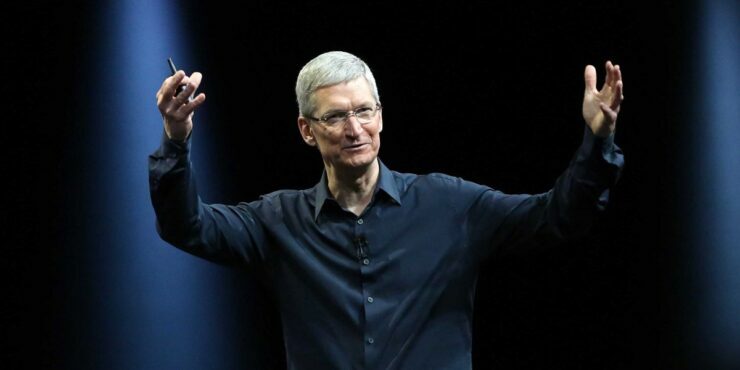 Tim Cook just went full-on Mission: Impossible on this one. You win, sir. The CEO is going through some company updates – the usual. Tim Cook: Apple Stores have over 500 million visitors per year. Apple is about to ship its two-billionth iOS device. Apple is going to talk about the Apple Watch first. Jeff is on stage to talk about the next Apple Watch. Who’s excited already? Interesting little fact: Apple Watch is the number one watch in the world. Whoa! Large edge-to-edge display. That’s awesome. It’s official: Apple Watch Series 4. Edge-to-edge display and curved corners. Over 30% larger than previous models. Available in 40mm and 44mm screen sizes. Series 4 is thinner too. Bigger display means more content which in turn means more awesomeness. The Breathe app is now available as a watch face. I mean, OK. The Digital Crown has been improved too and now features haptic feedback. Finally. A 50% louder speaker is there too. Series 4 has a black ceramic back. This means improved cellular reception. Series 4 packs a S4 chip (brand new of course). Powerful new dual-core 64-bit CPU offering up to x2 performance gains over older models. The Series 4 can process movement data 8 times faster. Apple Watch Series 4 can now detect a fall. This new Apple Watch knows when you’ve hit the ground and delivers an SOS message to rescue services automatically if it doesn’t detect motion for one minute. Three new heart features: low heart rate notification, irregular heart beat detection and ECG (electrocardiogram). Series 4 is the first ever consumer product offered over the counter to consumers. ECG happens all through built-in electrodes. ECG is a huge deal though whatever someone might think. Series 4 is FDA approved. Apple is very, very serious about health. Series 4: New design, larger display, New UI, Digital Crown with haptics, S4 x2 faster, louder speaker, fall detection, Bluetooth 5.0 and more. Same battery life of 18 hours. Series 4 introduction video being played. Guess who’s narrating it? Jony Ive. Available in three aluminum finishes, also available in stainless steel collection. Brand new gold stainless finish with a matching Milanese available. Your Series 1, Series 2 and Series 3 bands will work just fine with Series 4. Series 3 now $279, Series 4 starts at $399, and $499 for cellular. watchOS 5 final will be available next Monday, on the 17th of September. Come on, Time. Give us the phone and call it a day. iPhone has a 98% customer satisfaction. Tim Cook: This is going to be the most advanced iPhone we’ve ever created. iPhone XS is now official! Available in a new gold finish. Three finishes in total: Gold, Silver and Space Gray. 5.8-inch Super Retina display with HDR support, the usual. 6.8-inch display too. 60% better dynamic range than iPhone X.
iPhone XS Max is the official name of the larger phone. iPhone XS Max has Plus features. FINALLY! 120Hz displays. What’s up, Razer? Face ID is being updated too. It’s faster than before, Face ID. ‘Most secure facial authentication ever in a smartphone.’ That’s a big claim. Powered by A12 Bionic based on the 7nm process. A12 Bionic can handle 5 trillion operations per second. 512GB model will be available. On a personal note: A12 Bionic seems very fast, but real-world benchmarks will reveal it all. Apple going through iOS 12 features on iPhone XS and iPhone XS Max. iPhone XS basically, according to Apple: faster, faster, faster, smarter, smarter and did we mention faster? App demo time on iPhone XS and iPhone XS Max. First up is Bethesda Games Studios. New Elder Scrolls game for iOS! This looks pretty impressive. Wonder if it will be available for Android? Just asking.. for a friend. Elder Scrolls: Blades will be available this fall and available for pre-order right now. Steve Nash is on stage. Yup, the very same one. Showing off the Homecourt app and CoreML. New sensors across the board. Both cameras optical stabilized. New True-Depth camera that is twice as fast. The one on the front. ISP and Neural Engine now work together to snap better photos. Brand new Smart HDR feature. Bokeh lovers are going to love the new cameras. You can adjust the depth of field through the Photos app with a handy little slider. Now that’s handy! Four microphones lets you record stereo sound while recording video. Video really does look amazing on the new cameras. Wow. iPhone XS offers 30 minutes more battery life on top of iPhone X. iPhone XS Max offers hour and half of battery life over iPhone X. Basically the second SIM is the ‘eSIM’. No carrier support means no dual-SIM support for you. China gets the real-deal dual SIM phone where you can use two SIMs together. iPhone XS and iPhone XS Max announced. Apple now runs on 100% clean energy. One more iPhone to show us all! This phone screams color. Available in (RED) too. It’s IP67 and has an LCD display that goes edge to edge. Most advanced LCD ever in a smartphone. The display has a new name: Liquid Retina. Now that’s awesome. It’s called the iPhone Xr in case you’re wondering. The Xr does not have 3D Touch. Most advanced single lens camera, optical image stabilization. This phone can take portrait mode photos with a single lens. Yup, it’s happening. iPhone Xr has an hour more of battery life compared to iPhone 8 Plus. That’s a wrap. Hope you had fun.